Rachel Yang and Seif Chirchi started the Korean fusion restaurant Joule in 2007, and in 2012 moved it to this new location across from The Whale Wins in the Fremont Collective building. There is a new emphasis on steaks, and as they demonstrated with Quoin/Revel, they can deliver some really good cocktails with their excellent food. 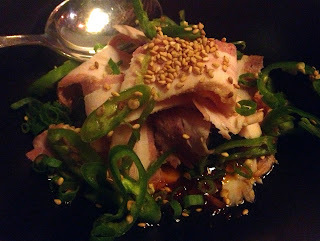 My Pork belly ham, salted shrimp and chili oil was quite tasty, and every dish coming past looked great. For cocktails, I had a very good and interesting "Jalisco Campire" (tequila, Lapsang Souchong, agave, Thai chile, and lime) and a fairly good "35 Stone Buck" (bourbon, Asian pear, honey, cinnamon, Rachel's Ginger Beer, bitters). Perhaps this last one was an idiosyncratic reaction, as I am not particularly fond of Rachel's Ginger Beer in cocktails, and this seems to put me in a tiny minority.